Okay, I lied. They’re not all under $100, but seven out of eight isn’t bad. My obsession with gold continues as I’ve been searching for the perfect metallic pump. While I’ve been leaning toward yellow gold in other things like jewelry and decor, I kind of like the silvery shade of the ones toward the bottom. And gold sequined shoes? Stop. I think I’m in trouble. Which ones are your favorite? Ahh, shoes! What girl doesn’t want a fabulous pair of shoes fitted comfortably around her foot, perfectly completing an outfit and single-handedly taking confidence levels from zero to hero (or heroine, in this case)? I would feel absolutely lovely in any of these kicks, which are each great company as we walk the line between end-of-summer and fall. These can go just as easily with sweet summer frocks as with stronger fall jewel-toned looks. Besides, this is the beach and heavy boots are still a long way off. Our transition period really lasts all fall long. Stay tuned for inspiration outfits in an upcoming post, and yes, go ahead and express your surprise — I am even CONSIDERING purchasing flats. Of course, only fabulous ones will do. Inspired by Jessica Simpson’s extravagant birthday gift, a new orange Birkin bag (can you imagine?! 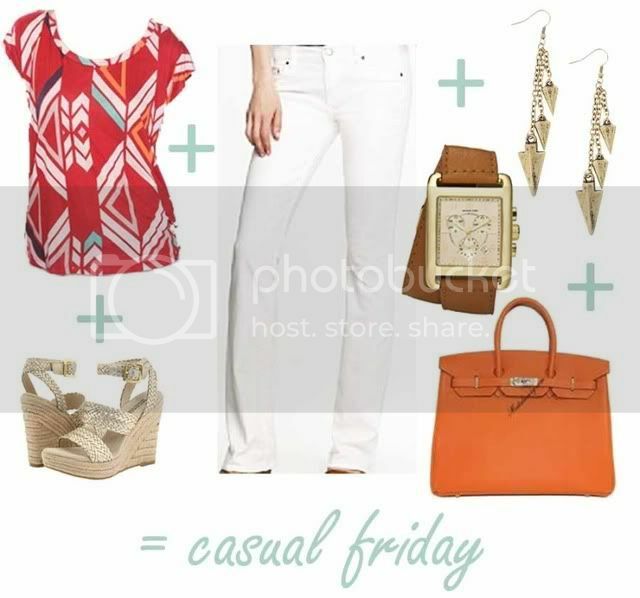 ), here’s a complete outfit with more budget friendly pieces to balance the high and low. Crisp white pants in the summer never get old and the math nerd in me is drawn to this red geometric top. A few gold accessories in the form of espadrilles, arrowhead earrings and a square-face double wrap watch complete the look. Chic and easy for a laid-back work day!